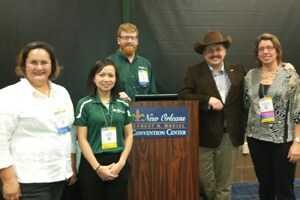 UMASH was represented well at APHA in New Orleans, Louisiana, November 17-19. Healthography was the theme for this 142nd Annual Meeting of the American Public Health Association. UMASH partner staff presenting and participating there from the National Farm Medicine Center in Marshfield, Wisconsin, include (pictured at left, L to R): Patricia Juarez-Carrillo, Iris Reyes, Scott Sandberg, Casper Bendixsen, and Amy Liebman. Amy and Patricia are with the Migrant Clinician Network which partners with the National Farm Medicine Center on the “Seguridad en Las Lecherias: Immigrant Dairy Worker Health and Safety” Project. Presentations included project information regarding these UMASH research, prevention, and education projects: “Surveillance of Disease and Injury in Wisconsin Dairy Farmers and Workers“, “Seguridad en Las Lecherias: Immigrant Dairy Worker Health and Safety“, and“Facilitating Return to Work for Injured and Ill Animal Agriculture Workers“.